We invite you to explore India - the Land with infinite beauty ! Whether you soar high into Himalayas or peer under the ruins of the Ancient monuments dotting the landscape of India, you will cherish the experience long after your visit ! This India Travel Guide on Maria Bambina Church, Kangeyam is free from any commercial interest! This site is dedicated to promote India - the vast subcontinent, its glorious past, magnificent landscape and its infinite variety. 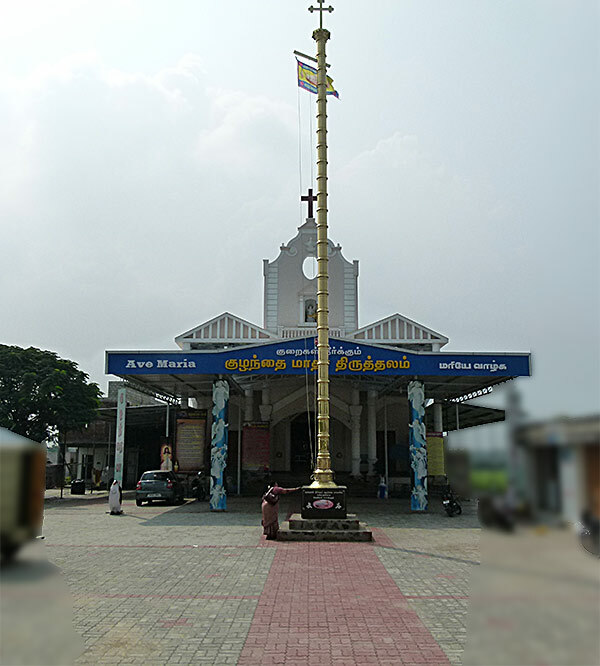 "Kuraigal theerkum Kuzhandai Madha Aalayam" - the Church of Maria Bambina was opened on 15th January, 2016 by Rev.Bishop Thomas Aquinas. 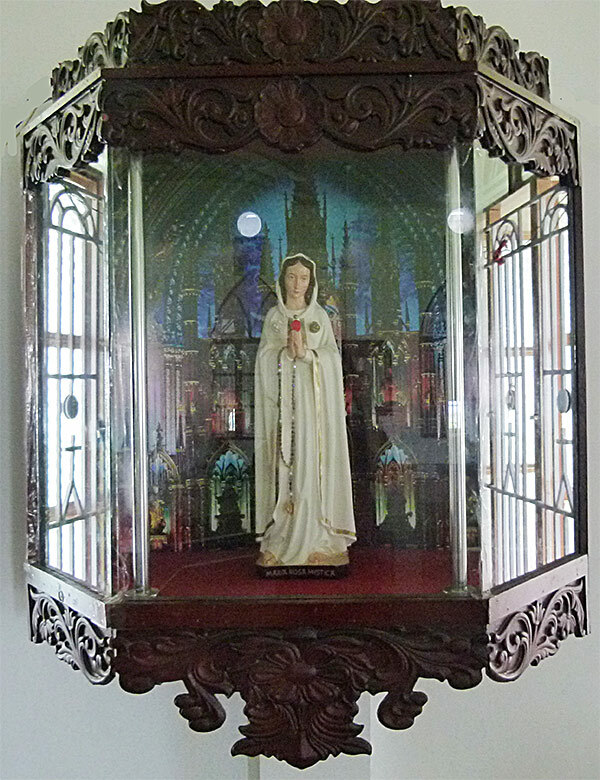 This church in honor of the Infant form of Mother Mary is unusual and probably one of the few Churches dedicated to Child Mary. Within a short span of time, Maria Bambina devotion has notched up a few miracles in this Church. As part of the Marian devotion, devotees who come here offer Novena. Many people who visit this church tie a yellow thread on the side of a wooden baby cot in the belief that their prayer for a child will be heard. 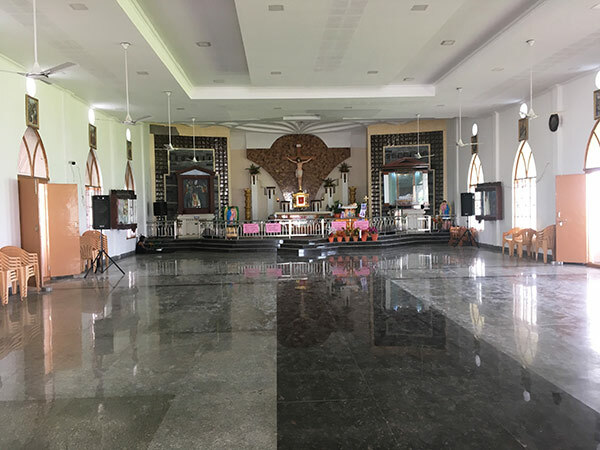 This church is located in the Nagapatinum - Coimbatore - Gundulpet Highway, a little away from Shri MahaRaja Mahal, in the Kangeyam - Kodumudi road. Kangeyam is about 60 km from Coimbatore and is a famous town associated with Kangeyam Bulls. 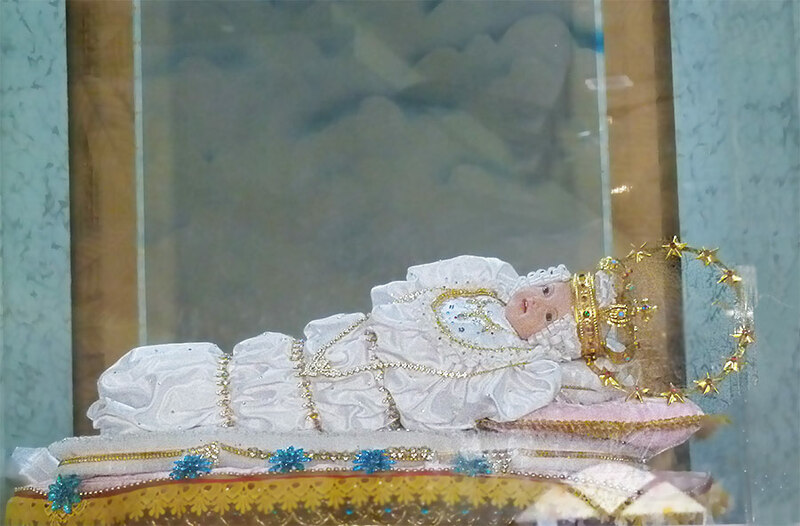 Before we delve into the Prayers and Novena dedicated to Maria Bambina - Kuzhandai Madha, we take a brief look at the history of the original Maria Bambina in Milan, Italy. History of Maria Bambina: The image of Maria Bambina - Child Mary was made by a Franciscan Nun some time before 1730 and eventually this image was left with the Sisters of Charity in Lovere, Italy. In the year 1876, this waxen image was shifted to the Mother House at Via Santa Sofia, Milan. Many miracles have been attributed to the image ever since. Infirmary hand Giulia Macario was cured miraculously from incapacitation - by the miracle of this Maria Bambina. At the same time, the dull gray image itself went through a transformation - it became the bright flesh tone of what it is today. Another miraculous recovery was made by Sister Josephine Woinovich who suffered paralysis of the limbs. Devotion to Maria Bambina spread from that time onwards. O sweet Child Mary who, being destined to be the Mother of God, has also become our beloved Queen and Mother, for the numberless graces you have obtained for us - listen to my humble prayer. All my hope is upon you, in all the needs which surround me. O Holy Child, by the merits and privileges which have only been given to you - be merciful to me. Sweet Child Mary, destined to be the Mother of God and our sovereign and loving Mother, by the prodigies of Grace you lavish upon us - mercifully listen to my humble supplications. In the needs which press upon me from every side and especially in my present tribulation, I place all my trust in you. O Holy Child, by the privileges granted to you alone and by the merits which you have acquired - Be merciful to me this day. Show that the source of spiritual favors and the continuous benefits which you dispense are inexhaustible, because your power with the heart of God is unlimited. Deign through the immense profusion of graces with which the Most High has enriched you from the first moment of your Immaculate Conception, grant me O Celestial Child, my petition and I shall eternally praise the goodness of your Heart. Holy Child Mary of the royal house of David, Queen of the angels, Mother of grace and love, I greet you with all my heart. Obtain for me the grace to love the Lord faithfully during all the days of my life. Obtain for me, too, a great devotion to you, who are the first creature of God's love. Hail, lovely and holy Child, spiritual garden of delight, where, on the day of the Incarnation, the tree of life was planted, assist me to avoid the poisonous fruit of vanity and pleasures of the world. Help me to engraft into my soul the thoughts, feelings, and virtues of your divine Son. Hail, admirable Child Mary, Mystical Rose, closed garden, open only to the heavenly Spouse. O Lily of paradise, make me love the humble and hidden life; let the heavenly Spouse find the gate of my heart always open to the loving calls of His graces and inspiration. Holy Child Mary, mystical dawn, gate of heaven, you are my trust and hope. O powerful advocate, from your cradle stretch out your hand, support me on the path of life. Make me serve God with ardor and constancy until death and so reach an eternity with you.